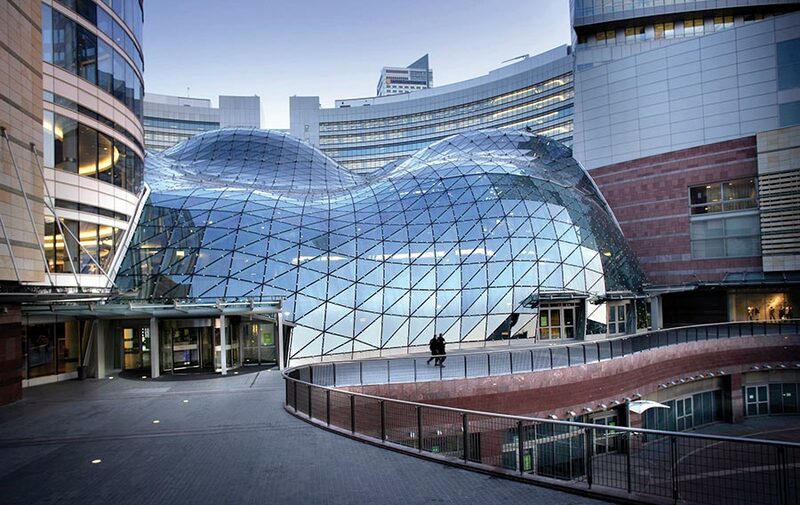 This view of the Zlote Tarasy center in Warsaw, Poland is an excellent demonstration of the many horizontal and vertical applications of above grade waterproofing. This story deals with vertical applications. 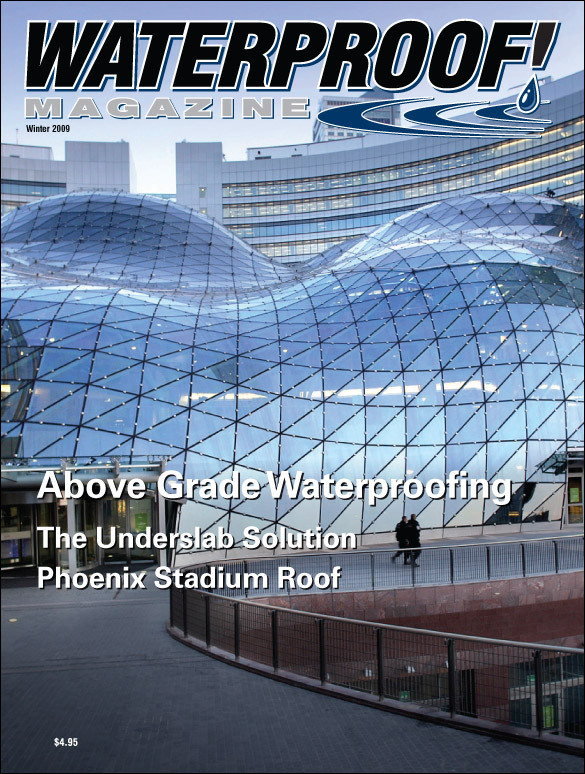 Part two, published next issue will discuss above grade horizontal waterproofing. Whether the project is in a coastal location exposed to driving sea spray, or in an area that only gets occasional rain, every building can benefit from above-grade waterproofing. In fact, every building must have above grade waterproofing if it is to last more than a few short years. Imagine a structure with no flashings, no sealants, no membranes on the roof and walls, no waterproofing around the windows. Above grade waterproofing is essential. 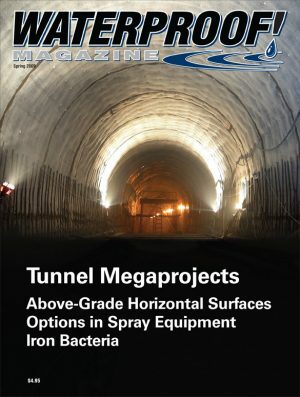 The topic is far too broad to be covered in a single article, but this story should give the reader a basic understanding of the principles involved with waterproofing vertical surfaces, and the categories of materials used. Options for waterproofing above-grade horizontal surfaces will be addressed in part 2 of this story, published later this year. For centuries, nearly all large structures were supported by immense masonry walls. Their sheer bulk—sometimes 10 feet thick or more—kept water from penetrating the interior. Additionally, the stone was unaffected by the moisture. 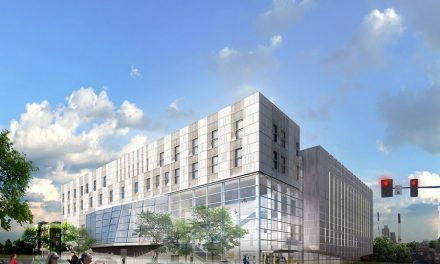 A whole range of high-tech materials have been created in response to these high-tech building techniques. Above grade waterproofing materials can be broken into five basic categories: sealants, coatings, tapes, flashings, and additives. 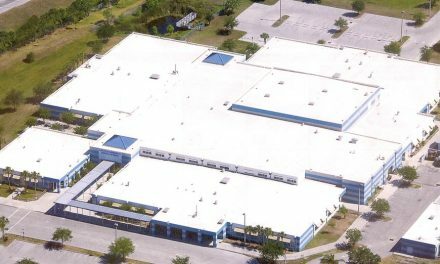 Products used for above-grade waterproofing differ substantially from their below-grade counterparts. Breathable: Above-grade coatings and sealants must be breathable. That is, they prevent liquid moisture from penetrating inward, but allow water vapor inside the wall to escape. “Breathable coatings are necessary on all above-grade wall surfaces to allow moisture condensation from interior surfaces to pass through wall structures to the exterior,” says Kubal. If a non-breathable vapor barrier is installed above grade, it can cause the product to delaminate from the wall. In wood-frame walls, moisture buildup will create mold and rot; in extreme cases, it may cause the building to collapse. With steel construction, moisture will oxidize (rust) the components and can also eventually cause structural failure. If the structure is cast concrete or CMU, moisture trapped behind a vapor barrier can cause spalling during freeze–thaw cycles. UV Resistant: Above-grade products, because they are exposed to the harsh sun, must be resistant to ultraviolet light. Below-grade products are typically not UV-resistant, because they will be backfilled and buried, usually within days of application. All above grade products, on the other hand, must retain their structural integrity and performance characteristics even after years of exposure to UV light. This is especially true of roofing membranes. Thermal Strain: Above-grade coatings and sealants are exposed to temperature variations their below-grade counterparts could never withstand. In the northern United States, for example, exposed membrane on dark surfaces often experience temperatures that vary by as much as 200 degrees. Products must be able to handle not only the temperature swings, but also the thermal movement of the products they are bonded to. 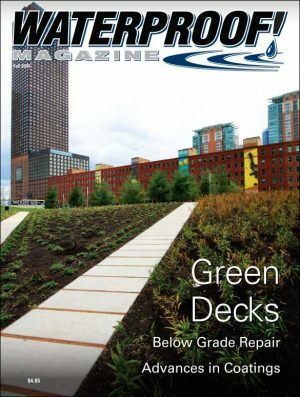 Abrasion and Corrosion: Unlike below-grade products, which are not subjected to wear, many above-grade coatings are applied to horizontal surfaces like balconies, plazas, and parking decks, where they are exposed to foot and vehicle traffic. In northern climates and oceanfront environments, above grade coatings must withstand exposure to salt and other chemicals as well, which are often applied as de-icing agents. Aesthetically Pleasing: Lastly, the material must be aesthetically pleasing. Sometimes, this is a trade-off, with architects selecting a water-resistant product that has the desired look over a completely waterproof—but architecturally unacceptable—material. Brick façades, for instance, are not completely waterproof. Rather than apply a waterproof coating, designers often install a membrane and flashing system behind the brick to divert water back to the exterior. While horizontal surfaces such as roofing are the most obvious application for waterproofing, the square footage of vertical walls is often 100 times greater, and allows much more moisture into the building, than the roof does. 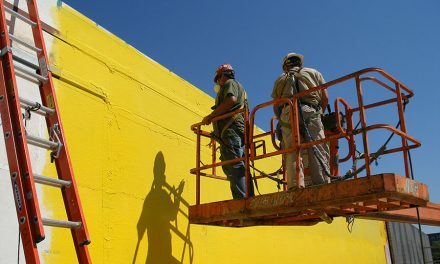 Coatings and Membranes: Products in this category are typically used to protect large expanses of walls, and includes fluid-applied membranes, sheet membranes, and sealers. 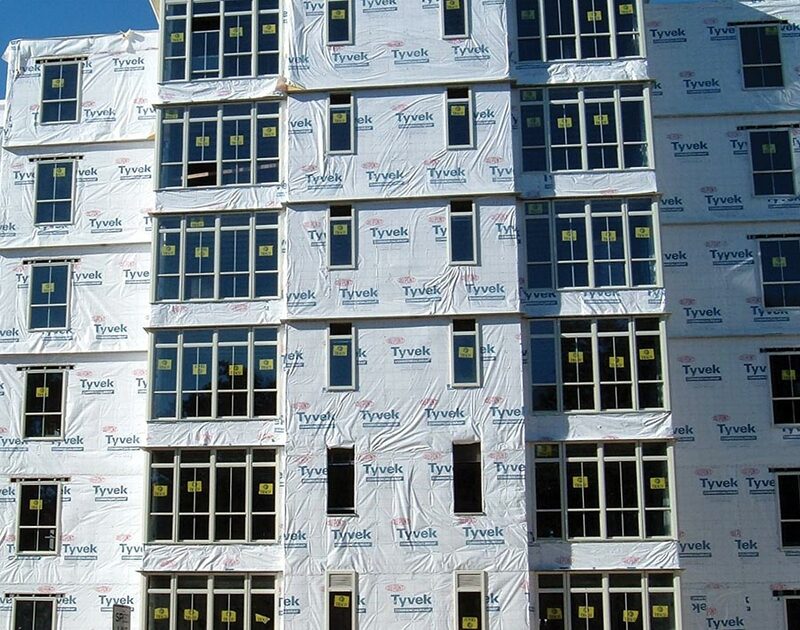 The most common product is “house wrap” such as DuPont’s Tyvek, which is a breathable synthetic paper-like material used to protect wood-frame light commercial construction. Like other sheet membranes intended for above-grade use, it is impervious to liquids, but not water vapor. When aesthetics are important, clear sealers are a good choice. They can be applied over concrete, stone, brick, or masonry. Some may change the glossiness of the final finish, but according to John Aiple at Terry Corp., most are invisible. “On red brick, the color will be slightly more bold,” he says. “On all other colors, it’s invisible. It’s water-based, so clean-up of overspray is really simple.” He uses a silane- or siloxane-based sealer, as it provides breathability that silicone does not. No sealer, however, is completely waterproof, although some reach as high as 98%. In cases where the surface will be exposed to wind-driven rain or standing water, additional waterproofing will need to be installed. A more waterproof—but sometimes less appealing—option is a spray-on membrane. These elastomeric coatings are basically paints with a high percentage of solids and resins. If applied to the proper millage, they are completely waterproof once cured. They can be used to create a surface that is both protective and decorative. Elastomeric coatings, however, completely obscure the substrate, so they’re often used behind the final façade. In all cases where the waterproofing is installed behind the façade, weep holes should be left at the bottom of the wall to allow the moisture to escape to the exterior. Fluid-applied membranes intended for below-grade work are not usually suitable for above-grade applications due to the factors listed above. A few manufacturers, such as Carlisle, Mar-Flex, and Tremco make spray-applied membranes specifically designed for above grade applications. Cementitious and Acrylic Finishes: At least half-a-dozen manufacturers make stucco-like finishes that also serve as above-grade waterproofing. True cement-based finishes use portland cement and sand, and are usually applied over a fiberglass or wire mesh to achieve some measure of tensile strength. These finishes are an inexpensive, proven method for above-grade waterproofing. Swimming pools, for instance, are a common application for this type of finish. FossilCrete is one product that is completely waterproof and can create nearly any look over any substrate. It can be used for vertical applications or sloped roofs. Perma-Crete is another cement-based product that can be applied on both horizontal and vertical surfaces. In fact, it is the only product that is ICC-compliant in both areas. The disadvantage of cement-based finishes is that they crack relatively easily, which allows moisture to penetrate into the substrate. Acrylic finishes, on the other hand, can be quite flexible. Made by Sider Oxydro, ORO and others, they simulate the look of stucco, but are completely waterproof and flexible enough to deal with the thermal stress and movement that occurs above grade. Many installers and designers are wary of “waterproof” acrylic systems, based on results of a South Carolina EIFS study done more than a decade ago. These new acrylic systems can match or outperform most types of above-grade waterproofing. Admixtures: “Using crystalline technology is an effective and reliable solution for both above- and below-grade waterproofing,” says Sheila Calder, who represents Kryton, a manufacturer of one such system. Crystalline technology is self-repairing, doesn’t impede the breath-ability of the concrete, and can be applied to either side (interior or exterior) of a structure. It also resists chemicals, such as acid, salt and chlorine. 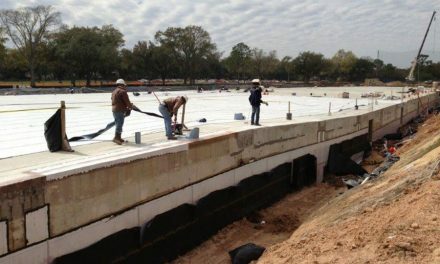 Waterproofing exposed vertical building components can include a combination of installations and methods that together compose a building envelope. For example, Slatex by Multicoat combines an elastomeric waterproofing membrane with a cementitous topcoat. It can be applied to virtually any substrate and can withstand heavy foot and vehicular traffic on walkways, ramps, parking garages, and other areas. If the building uses a variety of finishes (brick and stucco, or aluminum and glass) the job becomes even more complex. Some designs also use a variety of substrates. Masonry and wood-frame is a common combination for light commercial; steel and concrete is prevalent in high-rise work. To be Continued Next Issue…. 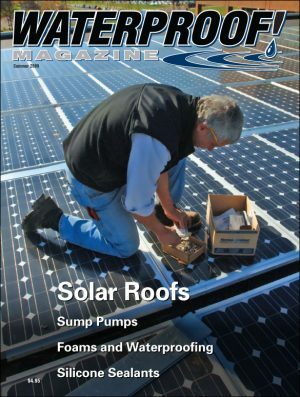 Roofs and other horizontal surfaces will be addressed in part II of this article, which will be published next issue. Every building needs above-grade waterproofing. The article discusses the qualities such sealants need, and the different types on the market. It’s perhaps the most overlooked area of the building envelope. But a significant amount of moisture—and moisture damage—originates from vapors coming through the slab. The huge retractable roof that covers the new stadium in Phoenix Arz., is an outstanding example of the innovative materials and craftsmanship that go into creating a state-of-the-art roof.